was definitely in stores in 1964, and Wattie’s cans were selling for 2/3 in that year. Imperial pricing pencilled on both items indicates prior to mid 1967, so I’d date them (widely) between 1962-1967. Recently, a reader of this blog contacted me to ask whether I would help them date a cache of items that were found in an old school building complex. They had been discovered when vandals on the property had removed some of the floorboards in one of the old dormitories, presumably looking for copper pipes to take. Whilst attempting to secure the aperture, before there was some kind of accident, they noticed a couple of things in the recesses of the dim hole. Upon further investigation was a selection of items that had been discarded over the years by a former student, or plural. Found repositories and the story they tell are one of my favourite things, like this lot, found inside a long forgotten American house cistern. These types of accumulations are obviously very different from collecting in which the acquirer may be particularly discriminate about categories; or hoarding – where there is complete indiscrimination in regards to a singular, or often multiple genres. A good example of this is children’s scrap books and things that they select to keep and then edit, gluing in items that may appear to be random, but in fact are not at all – it is done with complete deliberation and within that selection of items is data that tells a tale of the time. Erskine College, courtesy of and © Tom Law, TELPortfolio on Flickr. Discards on the other hand while equally as fascinating, have many different factors come into play that affect the agglomeration. Foremost, apart from the initial partiality involved in acquisition, what survives from that juncture is completely random – as opposed to any further intention being involved. There’s a lot of chance with what endures the circumstances and the environment – so many aspects become involved from thereon of what you will end up with. 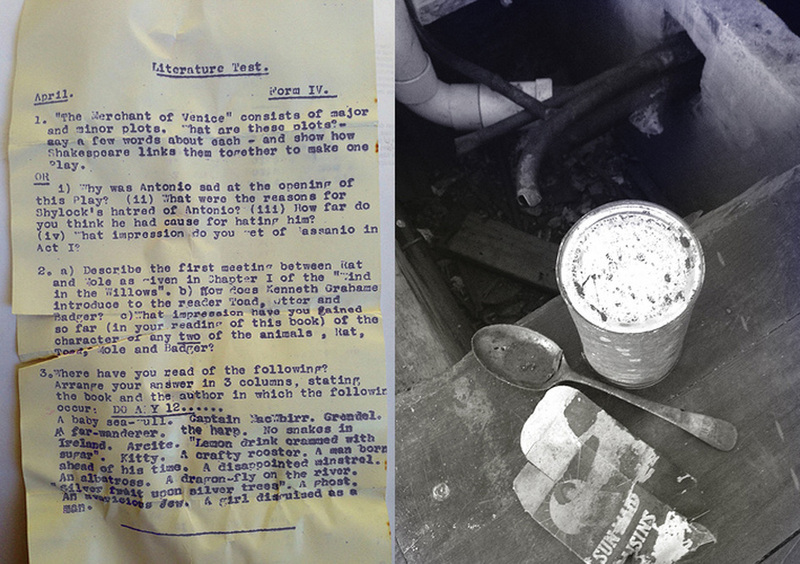 But essentially even though the items found may be just a fragment of a bigger picture, it can give you an awful lot of information about the lives of the people who discarded the items – you could write an entire thesis analysing the selection of items and the narrative it supplies. Erskine College, courtesy of and © Adrian Pratt, Life In The Land of the Long White Cloud blog. 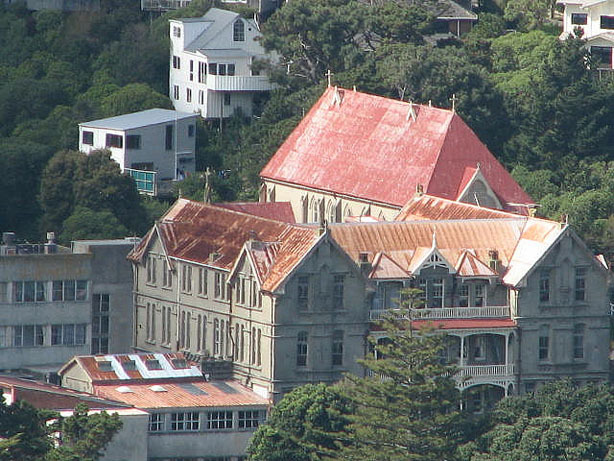 Wellington’s Erskine College, at the corner of Avon Street and Melbourne Road, Island Bay, Wellington was formerly known as Sacred Heart College, or in long form – the Convent of Sacré Coeur Catholic boarding school for women – until well into the 1960s when the name was changed to avoid confusion with Sacred Heart College in Thorndon. 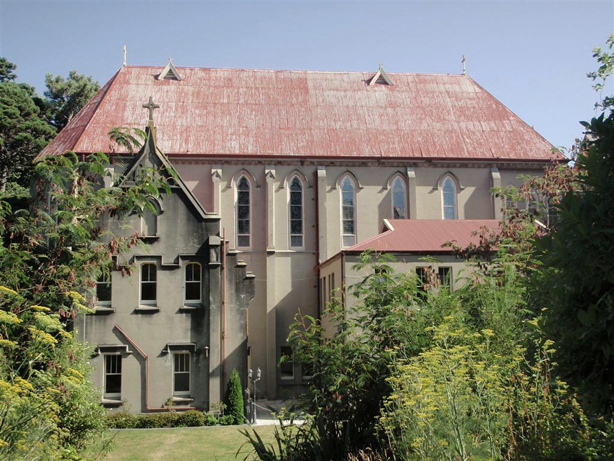 It is a collection of Category I historic buildings – as bestowed by the New Zealand Historic Places Trust – including former dormitories, and the Chapel of the Sacred Heart (considered one of the country’s best examples of Gothic architecture). 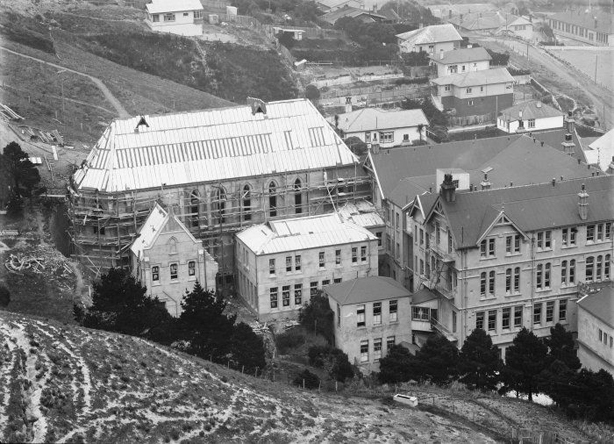 Built during 1905-1906 by the Society of the Sacred Heart (Sacré Coeur), and designed by John Swan, it was not only convent and school but surrounded by a farm, gardens and a grotto. 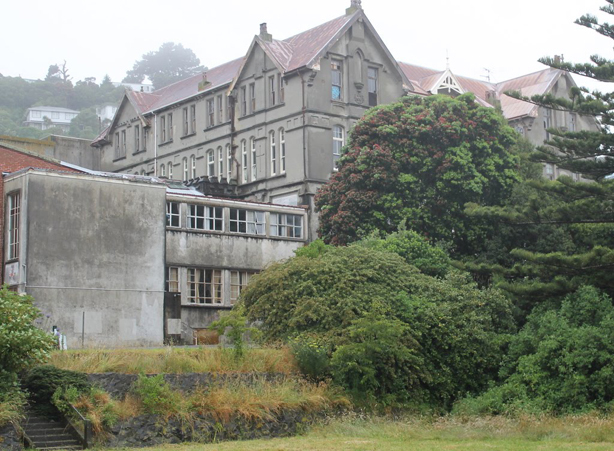 Some of Peter Jackson’s film, The Frighteners (1996) was filmed at Erskine, especially the flashbacks, the exterior mansion shots and the chapel scenes. The flashbacks occurred on the third and fourth floors in the hallway outside the room where these items were rescued from. It also seems during the Nineties and Noughties that some of the buildings were used for art studios as well as exhibitions (Learning Connexion art school). It has also been, in the past, a very popular venue for weddings and other functions. 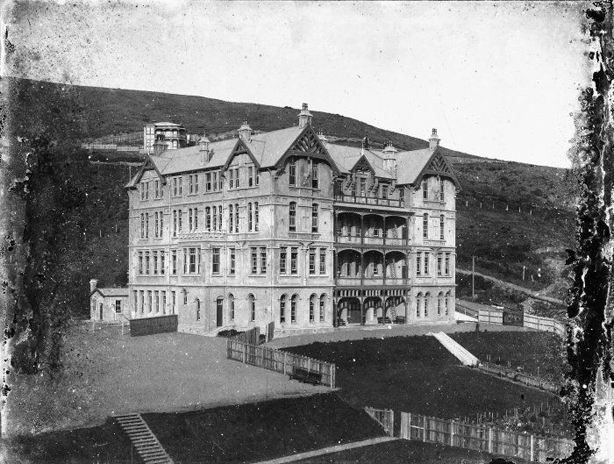 Sacred Heart Convent School, Island Bay, circa 1900. Courtesy of the Alexander Turnbull manuscript and pictorial collection, ref 1/1-002748-G.
Not only is it considered a sort of teenage rite of passage to visit the abandoned buildings, but stories also abound in regards to the property being haunted which only encourages break-ins and vandalism. 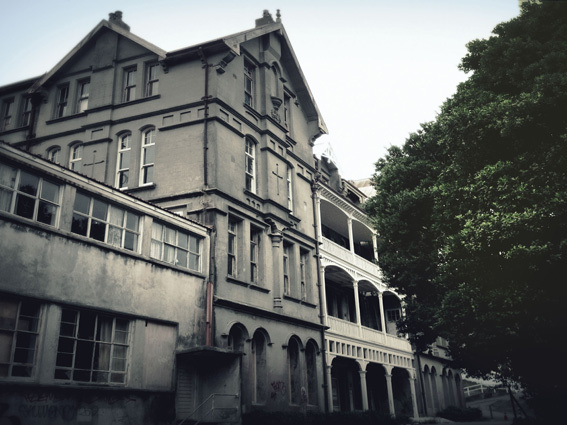 The current residents who say that since they have moved in to one of the accommodation wings on Erskine‘s grounds – there have been “no signs of ghosts yet” do attest to having to be vigilant and have kicked live trespassers out several times in the past. Those thinking about “exploring” inside should take into consideration that not only are some of the buildings dangerous given they are abandoned and deteriorating rapidly, but also closed off because they are earthquake prone. Options are the owners doing very costly stabilising work, or alternately demolition, discussed in an article here. It’s a shame about all the politics surrounding the property. Quite frankly it sounds like the owner that bought it a decade ago or more, typical of developers, knew what he was in for but went in with plans to eventually try to overturn the heritage protection in any way he could, just letting it run down, tying everyone up with red tape, and then blaming everyone else for exactly the same thing. The on-going battle of wills is discussed in article here. I predict eventually he will probably get a healthy leg up from local government for restoration as well as permission to remove all the non-heritage listed structures and build it in with apartments. I am sure he has plans to make his money out of it. In the meantime all the agitation in the community will probably only serve him to achieving his end goal I imagine. It’s one of those situations where, as they say – damned if you do, and damned if you don’t. Erskine College and grounds, © Lindsay Shelton and courtesy of Wellington Scoop. However, contrary to posting around the web saying there’s no electricity on the premises and nothing to restrict would-be adventurers, it is par-residential, there is a security system which is in place and working, as well as odd patrols after a break-in incident in which “youths tore up yards of flooring” according to someone who reported the incident on the College’s Facebook page. That’s obviously how the assemblage I feature here came to be inadvertently revealed – found in the main college building, one of two “red-stickered” areas on the property. It is unknown whether all of the items were placed there deliberately (given that the floor board seems to have been easily removable, this is very likely), or some of the smaller bits and pieces just fell through the cracks into a cavity between the fourth floor and the third floor ceiling. It may be a bit of both. There may have been just one occupant to the room for a length of time who made a habit of doing that (unlikely that anyone else knew about the loose floorboard). Some immediate things that struck me – mostly the items were sweet things, such as snacks. Perhaps contraband, and disposed of where it would not be found. The schools may have been strict about eating anything in dorms – as well as junk food and non-school foods found in rooms. Along with the Disprins, You get the idea that these items may have been cravings that accompanied “that time of the month” perhaps. Sheep’s tongues may now seem a strange thing to have druthers for on the sly but no accounting for taste (not often seen on the lunch or tea table these days, they were extremely common in decades past; still popular even when I was a child). This tells me the person was missing domestic life and home cooking probably, and this was a little bit of “comfort”, or perhaps they were part of a care package from home. Of course a big question is – why they would put all those things under there when it was easier to put it in a bin? It does point to not wanting anyone to know about it, or for it to be found. It could be just as simple as laziness, or good old (Catholic) guilt. Or both. It’s fun for me to try and narrow the cache down without any idea of dates or significant clues, but of course the biggest lead is a potential name . The serial litterer seems to be a fourth form boarder named L. Reilly. If we could track the person in question down, there may be some more information on the details of their life at Erskine and the motivation behind dropping this stuff into a gap under the floor. On the other hand, she may not like the idea that some things have been dredged up unexpectedly such as an English test she likely cheated on (otherwise why not just put it in the bin instead of stuffing it in a can and hiding it), or the nicked spoon that accompanied the empty tins, (which bears the college’s initials SH for Sacred Heart). Personally, I know I would feel a bit weird about people going through my old trash. However, there’s a possibility that our culprit is included in one of the Sacré Coeur reunion photos in this archive here, Which feature classes from 1930s onwards. Erskine College, circa 1937-1938. Courtesy of the Alexander Turnbull manuscript and pictorial collection, ref 1/2-046458-G.
All of the items were well-documented in detail which means quite a number of images. 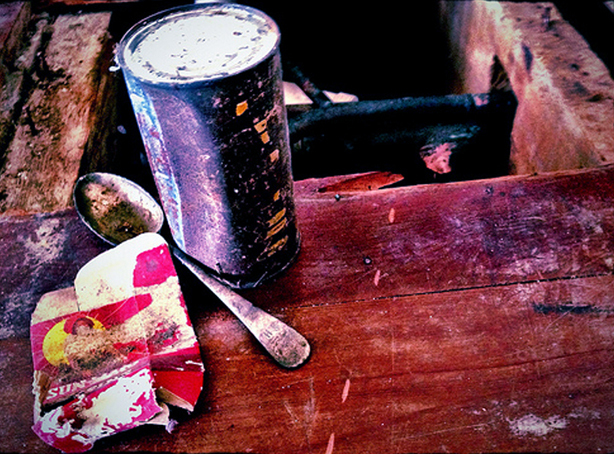 Ergo with the author’s permission I’ve selected and edited the most interesting and curious things for this article – either they have a good story behind them or they are the sort of thing that rarely survives the dustbin or dumpster so that in its self makes them worthy of being featured (how many used ice cream wrappers survive for example? Very few that I have seen). The salvager is intending to use a section of the floorboard in question that had been pried up as the base for a small cabinet to protect and display the items as a fascinating microcosm of student life in days gone by. 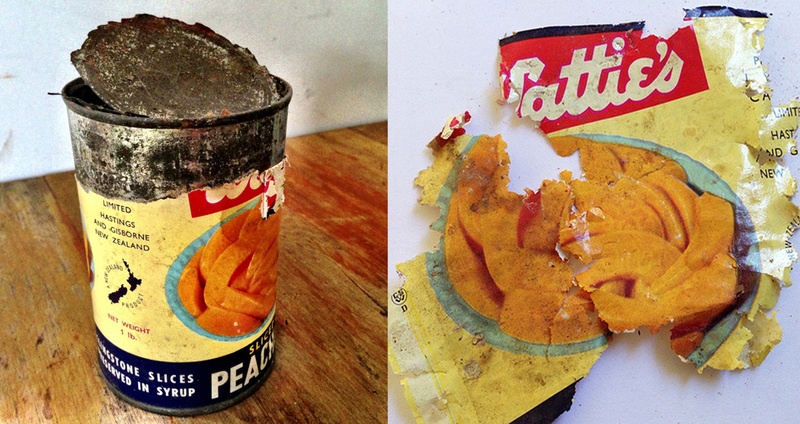 A shot of the hole with some of the items beginning to be retrieved – a can, a spoon and a Sun Maid raisin packet. So, what’s my prognosis as far as a time period on this haul? Initially I had dated it between 1965-1968. 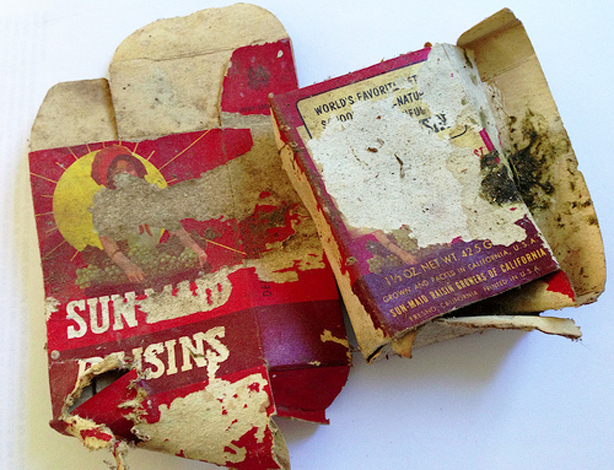 Now I’ve gotten a good look at the Sun Maid packet below, this definitely dates between 1969-1976 – but probability is on 1971-1972. Since the Disprin bottle indicates things are as old as 1961, It’s looking likely there were multiple discarders over a successive period of up to ten years, but most of it was just one person with perhaps later items like the raisins and the NZ Rail ticket just slipping through gaps in the boards by chance. If I re-narrowed the dates to the least possible, it would still be 1967-1972. 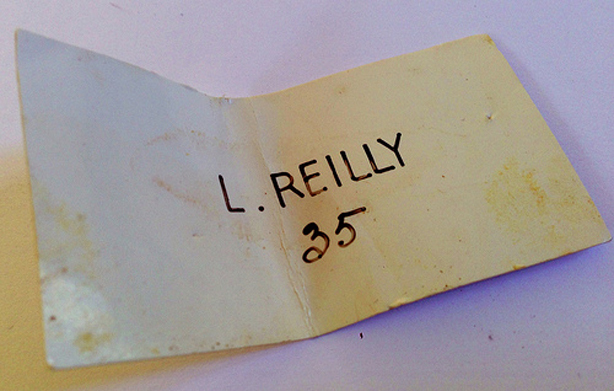 Oh, and – L. Reilly…where are art thou, you naughty minx? No worry about getting detention now – so come out, wherever you are. Credits: all photos © Kylie Walker unless otherwise specified. Study of the spoon found with cans, S H (Sacred Heart) indicates it dates from before 1960 when the name of the institution changed to Erskine. On the left a page from a fourth form literature test. We suspect it may have been pinched in order to cheat, otherwise it would have been thrown in a regular bin and not hidden. The test questions, a Newman’s Coach ticket and the picture of P.F. Jones were all tucked away in a tin with removable lid. On the right, another shot of the hole in the floor. James Smith was a Wellington institution established in 1866 and ran until 1993 when Farmers’ purchased it from L.D. Nathan and shut it down. The five-story flagship department store was on the corner of Cuba and Manners Street. By the 1980s they had five branches around the Wellington area. By at least 1972 they were definitely known to have a devoted girls school uniform department so I would say that this dates from before that decade. I was unable to find any information on Garrattco or Rabo, indicating it was likely a company established post 1945 – the 1950s onwards. I think this came from a new uniform garment that was ordered and then fitted in-store, and was brought with the person at the beginning of a term. Hence no price on the tag,and the measurements, as well as customer’s name scribbled on. I’m guessing early 1960s. Possibly a card with the dorm room number, as well as the name of the occupant. We do know that Reilly was in situ in the late 1950s-early 1960s, and likely around the age of 13-14 years old. ergo, born in the early 1950s. 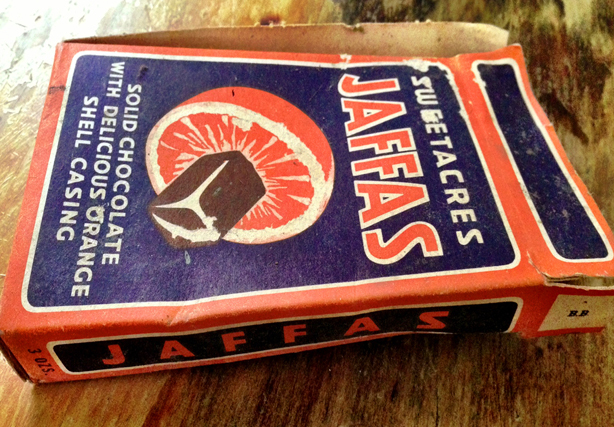 This Jaffa Box is likely from the early-mid 1960s. I think they were running this design for a while so it could have been around up to the late 60s. Imperial weight only shows it was definitely produced before 1972 . It was exactly the same in Australia. One clue here is the printer’s mark B.B. which likely stands for Bank’s Box (Company), who were around from at least the 1920s-1930s. They had factories in Auckland, and Wellington. This was in stores early-mid 1960s. Imperial indicates pre 1967. Wattie’s tended not to change some labels very often and would frequently run designs for over ten years or more. I have one almost identical except they have revised the picture of the peaches in the blue bowl, here. New Zealand Refrigerating Company ( also known as CMC or Christchurch Meat Company), was one of those products where they never really changed the label for decades. It pretty much looked the same from its inception back in the 1900s. As I recall CMC shut down around 1984. Given the cache are together, they probably date from the 1950s-1960s. 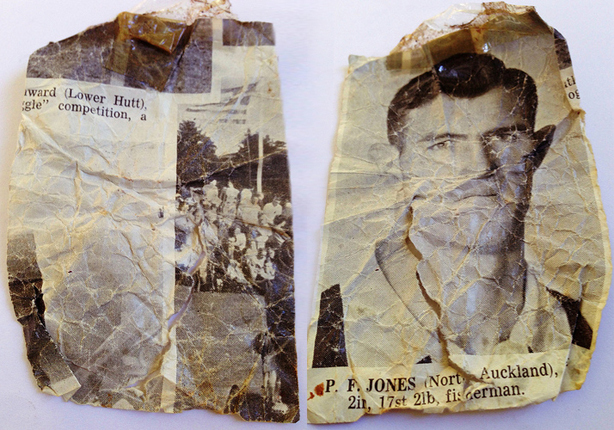 Peter Frederick Hilton Jones played for the All Blacks in 37 matches including against the Springboks in Johannesburg in 1960 and notably scored a try in the 4th test of the 1956 South Africa tour of New Zealand. I wondered what significance the picture torn from a sporting article in a magazine has? It seems such a random choice that it’s in likelihood not random at all. There’s a few options: schoolgirl crush perhaps, or it had some kind of personal significance, or was used for some kind of drawing project. There are considerations in why someone would remove a picture to keep it, and then crumple it up throw it away stuffed in a tin where nobody would find it. Along with the test paper and the picture of P.F. Jones, the discarder obviously did not want anyone to find the items in a communal bin. I wonder if the sisters used to go through the rubbish looking for anything incriminating? I imagine it was very strict and even if not breaking a rule, it would be embarrassing to be questioned. 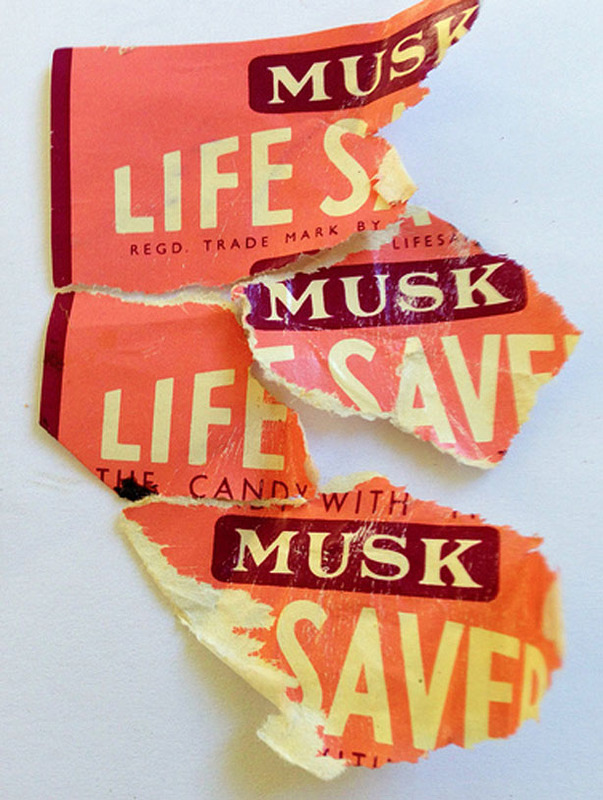 Lifesavers were actually around in New Zealand from the early 1920s. Again this was one of those products where they never really changed the label much except for minor adjustments. In later years Parnell-based Heards confectionery, established 1914 by Leonard Heard, had the domestic license for this brand. It could date from any time between mid 1950s-mid 1970s probably, but I would guess the mid 1960s. Kaiapoi Woollen Manufacturing Company was the first woollen manufacturer in Canterbury, established in 1878 , and closed in 1978 – so this item definitely dates before that time. In 1963, the company became Kaiapoi Petunia Group Textiles Ltd but there’s no indication of the company name here to help narrow things down. Again I’d guess 1960s for this school garment label. Tip-Top Trumpet wrapper. These were launched in 1964, so this item is after that date. 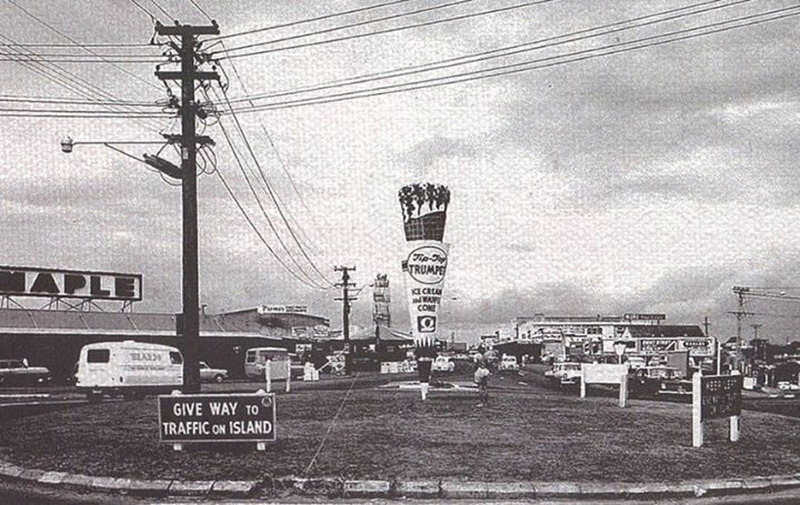 Giant Trumpet on a roundabout in Panmure, Auckland, year unknown. Obviously post-early 1964 although late 1950s car models are visible. The design is the same as the wrapper above. Provenance of photo unknown, probably from the Fonterra Archives. 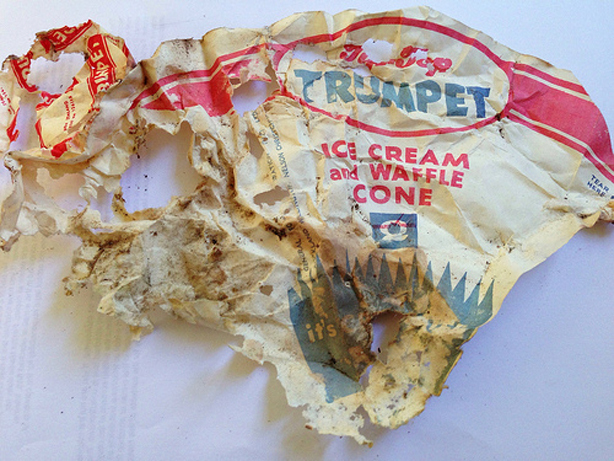 Close-ups of the Tip-Top Trumpet wrapper. It is kind of amazing this has even survived. 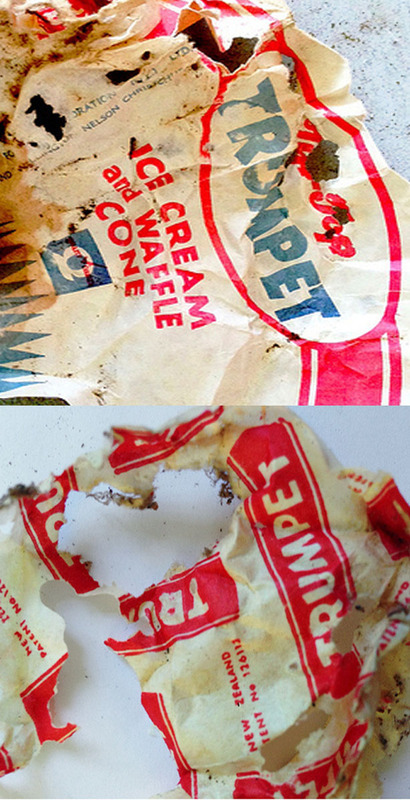 Given they were almost without exception tossed in the bin – or if kept easily damaged or deteriorated from contact with food, any frozen confection wrappers are extremely rare. I’ve never heard of this product but I would guess 1950s-1960s, more the latter. Aulsebrook’s commenced to manufacture confectionery sometime in the 1890s and were probably the biggest brand in New Zealand next to Cadbury Hudson. Wrapped candies in bags or packets seem to have popularised from the late 1950s-early 1960s. Singular indicates that it may have just slipped through the floorboards but unlikely. 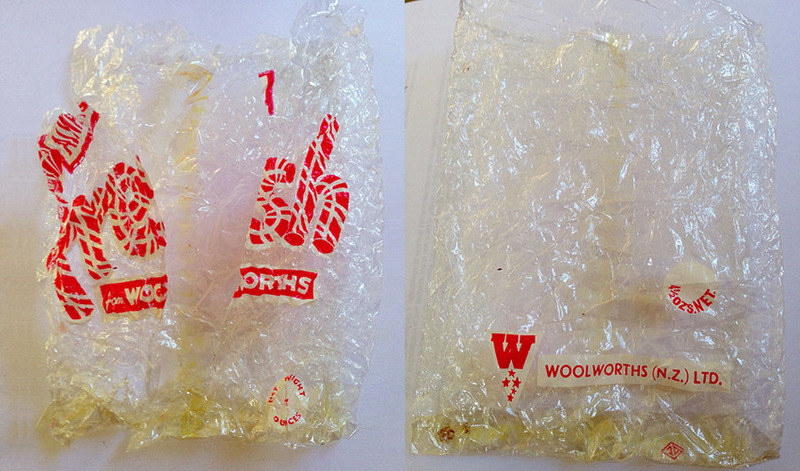 It is likely they were part of a Woolies pick ‘n’ mix, purchased in the bags below. There may have been other different wrappers but they have either disintegrated, been eaten by insects, or carried away by rodents to a nest. Update early 2015: One of my readers has now claimed they remember these being made in the 1970s. So, these are the bags for some of the random lolly wrappers like Aulsebrook’s above. I’m theorising that because the bag is printed with “fresh” indicates it was made specifically for marketing food, the striped peppermint canes of the font pretty clearly indicates candy. Woolies didn’t really start having separate food markets until late 1963 onwards. this logo was definitely in use at that time. Before that Food Fair was always a department. I would take a stab at mid-late1960s for these items. Woolworths Variety Store, Lynnmall , late 1963. 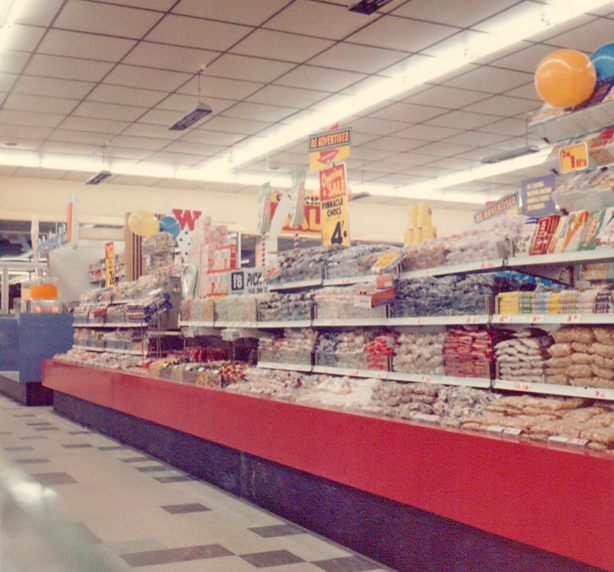 This photo shows the confectionery section with Refreshment Bar near front of store. Woolies would have open glass pick and mix bins, you can see them to the left. I remember as a very young child going to (this particular) store and occasionally being allowed to get a selection. Photo courtesy of and © Lance Bates, Degilbo on Flickr. I’m not familiar with this particular product, but obviously I remember the Mackintosh’s brand very well – particularly their bagged Toffee De Luxe which was extremely popular in the 1970s-1980s. I would guess 1950s-1960s for this, more the latter. These kind of snap-apart bars were popular in the late 1950s-early 1960s from ads I have seen. Inner and outer wrappers of above , showing the embossing on the foil. You never get to see things like this outside of a scrapbook, and even then people tended not to keep foil – it was usually easily damaged in the unwrapping and not that interesting anyway in comparison to the outer. 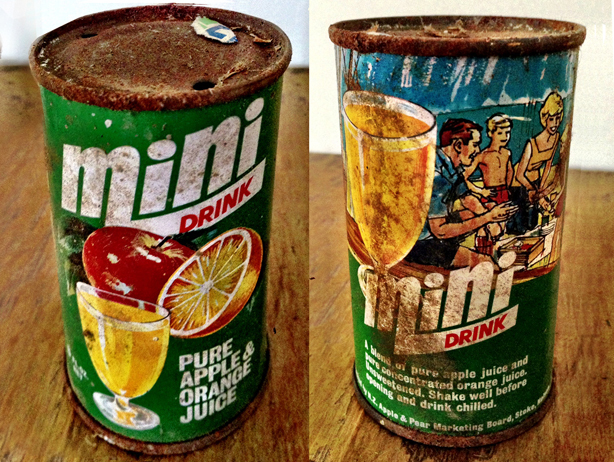 Mini Drink, which was pretty much Fresh-Up in a different can – was apparently launched by the N.Z. Apple & Pear Marketing Board in 1967, according to company literature (I don’t know if I believe this date entirely). If I had guessed without knowing anything about a date I would have guessed 1966-1970. 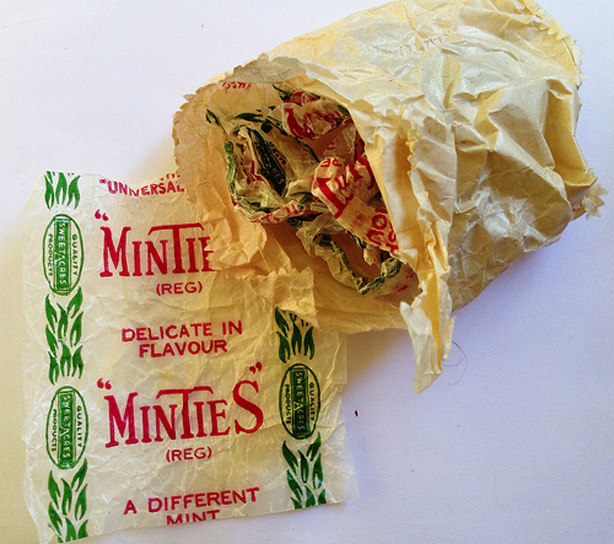 A dozen or so Sweetacres Minties wrappers were stuffed in a grease-proof paper bag. I do wonder why it was not in a proper Minties bag or container. I guess they were bought locally from a dairy or corner grocery and were from a bulk counter tin. Minties were present in NZ from the 1930s; Sweetacres was an Australian Brand made by Henderson Sweets/James Stedman. This was one of those products where they never really changed the label (and still haven’t much). I’m a little confused about the history of Sweetacres in Aotearoa but I believe that Griffin’s had the rights for the brand until 1984 when Pascall purchased it. So it’s one of those things that you can’t really narrow down unfortunately. I would guess 1960s. Newmans has run coaches since the 1870s but it was in the mid-late 1920s that a fleet of motor vehicles was established. It remained a family-owned business through to 1972 when it merged with Transport (Nelson) Ltd, so it’s likely this ticket on the right dates before that time. As for the New Zealand Railways cover and stub on the left – I get a late 1970s-early 1980s vibe from these graphics, giving credence to possible multiple discarders. It could not be any later than the end of 1985 as the school shut at that time. This was the kind of ticket that was for long train journeys cross-country so obviously was from a pupil that travelled quite some distance to board at Erskine. This label from a garment indicates it was printed in Britain and I can’t see any reason that would be done unless the whole garment was made there and imported. 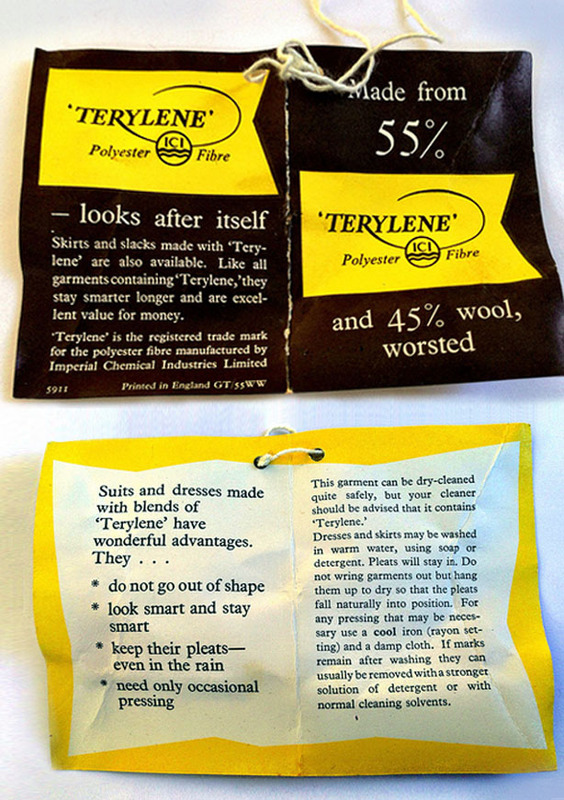 ICI didn’t start commercial manufacture of Terylene in England until after 1955. I am sure this fabric revolution made its way down under pretty quickly, but it still would have taken some time. I am guessing early 1960s for this item. Sun Maid raisins, imported from the Sun-Maid Growers of California in the U.S., were present in New Zealand from the 1920s and the imagery and packaging barely changed well into the 1980s. It’s probably still the same now. It would be really hard to date this item if it wasn’t for the presence of dual systems indicating the weight. Metric began to be introduced in 1969, and the bulk of the changeover was undertaken over 1971-1972. However up until as late as 1976 both were included on some products for those that were pretty slow on the uptake. However what should be taken into consideration is when both metric/imperial was included in duality on American packaging for export, even though they never switched over themselves. As far as I am aware an Act to include both on domestic products was only introduced federally in 1992. However this practice for exported goods may have commenced earlier than New Zealand introduced the metric system, to cover a multitude of different countries and accommodate their various systems. Reckitt & Colman (NZ) Ltd changed to Reckitt, Colman, Nugget in the very early 1960s – definitely by May 1961 – so this bottle likely dates before this – perhaps stretching out the date of the stash taking into consideration that it may have been old stock, or were sitting around for a couple of years until finished and discarded. There’s a possibility that the company just didn’t bother updating the company name or had piles of packaging stock to use up that lasted some time. I’d like to think that we have a single discarder, but this indicates not – and that other boarders knew about the hidey-hole. 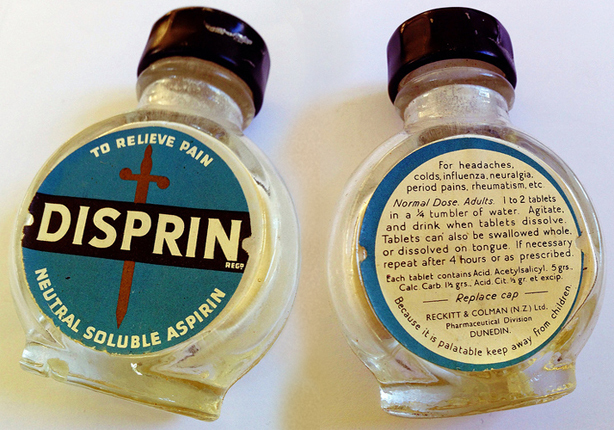 Sorry, it slipped my mind until I re-read your Disprin caption – this bottle was in L Reilly’s stash tin as well, so I believe it was likely old stock. I used to love chocolate éclair lollies, so yummy, they were hard and chewy on the outside and then chocolatey goo in the middle, the best!! I was fairly uninterested myself at the time, but forced to take part, I have a vague memory of shoving in a pair of knickers pinched from some luckless boarder. I believe the intention was to retrieve the capsule in 25 years. As the school closed in 85, I wonder if it is still there waiting to be discovered? Thanks for this interesting story Cath! That will be a revelation to someone I know! Oh yes? If there’s an end to the story, please tell! I am coming back to NZ for an Erskine reunion in Feb and would love to have a new story to share…maybe I could even make restitution and return the poor girl’s undies. Well, if the person in question sees your comment, they may well invite you over for a hunt. I was there mid to late 70s as a boarder. I still have my room card with my number that you carried through your whole time there. I have copies of newmans tickets and copies of work sheets that are in the same format as the exam sheet. I had a Reilly in my class…but she was F and a day student. We all shopped at James Smiths as most boarders had accounts there and a regular outing was Friday night for a spider.. my room in 3rd form was top story, corner room…my dad always said it would be the first to go in an earthquake! Hi Lynda, Thanks for the memories and information. Thanks for the information. Which corner of the third form was your bedroom? Plus ,…lots of he knives and forks in my era still had SH. Likewise salt shakers etc. 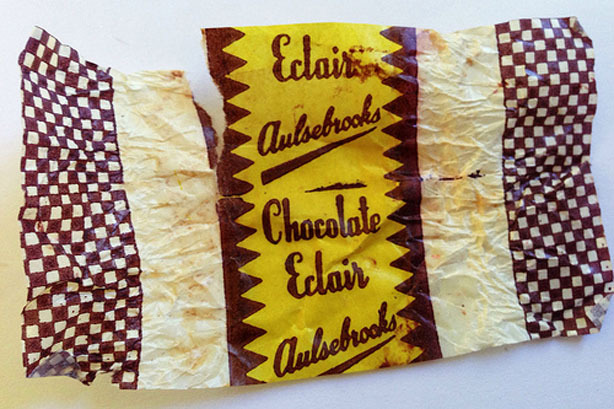 Also i clearly remember tne chocolate eclair lollies…perhaps your date could be 1970s? Yeah, it could be early 1970s but some of the items absolutely definitely date between 1963 and 1967. That’s not debatable. Again it seems pretty obvious there were discards from more than one person because they span over a period longer than the few years an individual would have been at the school. I’d be up for a treasure hunt next Feb, Person in Question! Thanks for the information. I didn’t know about the time capsule – neither did the owners. Depending on where it was buried, there’s a very good chance it’s still there. When and where is February’s reunion taking place? I’d love to find to out more – I have SO many questions about Erskine, starting with: Was there really a suicide pact or attempt there in the 1970s? – and would definitely be keen on a treasure hunt when you’re over next year. I remember chocolate eclair lollies were an necessary part of surviving boarding along with mallow puffs that were sold in boarders tuck shop. Also essential: plenty of Impulse deodorant spray to cover the smell of cigarette smoke…some happy but cringeworthy memories! Go for it kids. Great to get a date/source on the eclair candies finally. Update on this story: It seems as if we are inching closer to solving this mystery. Some information has come in, regarding a student just prior to 1966 by the name of ‘Lynne Reilly.’ She attended a reunion in 1966 with someone named Irene Reilly who is likely her mother. If she is the correct person, her government name was Lynda Ruth Reilly, she and her parents, Irene Constance nee O’Sullivan and Declan Melville Reilly, lived in Rangitikei, Manuatu-Wanganui district. So she was on the shortlist of fifteen Kiwis I had whittled it down to. What this tells us is clearly more than one person knew about the floorboard and successively discarded things into it over time. Also, the number may not be a room. A former student of that time tells me each student was assigned a number when they enrolled and instead of using names for documentation, the numbers were used.